Platform Overview — Supporting Resilient Communities, Inc.
>>>> with a free, locally-based, locally-controlled hub website for all responding organizations and government entities after a disaster. Municipalities and organizations can manage donations, organize volunteers, and meet the needs of residents. The smallest animal shelter and the largest NGO can collaborate in one space to broadcast rapid updates and meet a family's diverse needs, with a flexible and free software platform that can be used by anyone without training. Affected residents and the wider public enter their need or offer into confidential databases accessed by local organizations, who can match skilled help and donations to the families that need them, without duplication. THERE ARE NO BOTTLENECKS. The platform works as fast as the fastest organizers on it do, so if one organization becomes overwhelmed or leaves town, the others are not stopped from collaborating and making progress. No organization can slow down or throttle another. The system is transparent and democratized. A website for each community to manage donations, organize volunteers, and meet the needs of residents. We have a demo page where you can play the role of resident, volunteer, or nonprofit organizer: press every button and enter information without any risk. 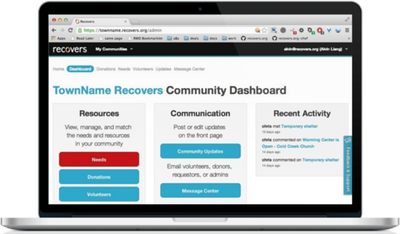 If you'd like an admin-level login to our demo page, please email support@recovers.org and we'll set you up!